Now that we have a Disney Minnie Mouse St. Paddy's Day outfit for girls, we just had to do something for boys. Soooo, here we have our boy's Mickey Mouse St. Paddy's Day leprechaun shirt. 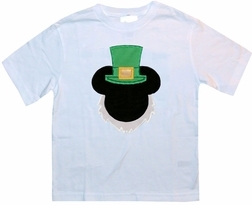 We start with a white cotton shirt and applique Mickey leprechaun on the front in black with a green hat and gold buckle. To finish him off, we gave him a full white beard!